For awhile now, B has been exclaiming how wonderful a Vietnamese dish called pho is. Unfortunately, since it is usually made with a beef broth, it looked like I wouldn’t be able to partake. Then, we found a local place that had vegetarian pho! Yes, this pho contains a vegetable broth. B went with her mother one day and raved about how good their food was. She wanted to go back to eat more pho and I wanted to go try it out as well. Recently, we got the chance to do just that. 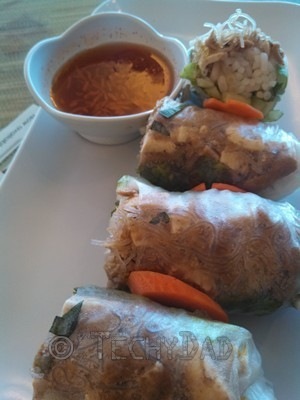 We started with some My Linh summer rolls. 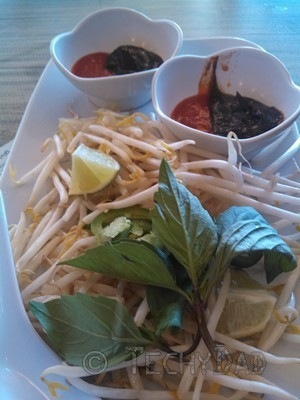 These have rice paper wrapped around noodles, lettuce, cucumber, bean sprouts, mint and basil. We added in shredded tofu and a vegetarian sauce. These were delicious. Very light and refreshing. There’s a lot in an order, so this could be either a meal in itself or an appetizer for two. Next, came the pho. Pho is basically rice noodles and onions in a broth. Bean sprouts, basil, jalapeno, lime, hoisin sauce, and Sriracha sauce are served on the side so you can add as much or as little as you like. Pho can also have various add-ins. 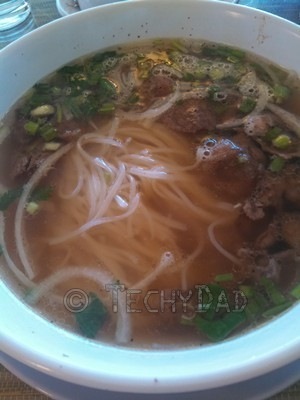 B had her pho with beef broth and added in beef brisket. 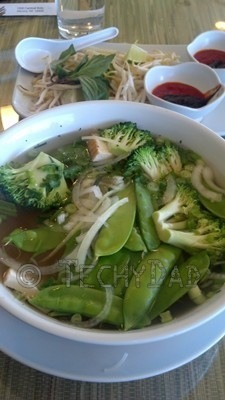 I added tofu, snow peas, and broccoli to my veggie broth pho. The pho was amazingly good. You definitely need both a spoon AND fork to eat this soup. I added all of the sides to my pho, but went easy on the Sriacha. Still, it had a good kick to it. I’ll definitely need to get some rice noodles from the store so I can try making my own pho one day. 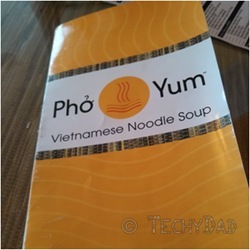 Have you ever tried pho? Have you ever tried making it at home?